By signing this agreement, all member organizations agree to accept the terms contained within. The Protein Data Bank (PDB) is a worldwide archive. At present, data are deposited with and processed by four member organizations: the PDB managed by the Research Collaboratory for Structural Bioinformatics (RCSB), the Protein Data Bank in Europe (PDBe) at the European Bioinformatics Institute (EMBL-EBI), the Protein Data Bank Japan (PDBj) at the Institute for Protein Research in Osaka University, and the Biological Magnetic Resonance Bank (BMRB) at the University of Wisconsin-Madison. All processed data are integrated into a single archive for worldwide distribution. It is essential for the progress of global science that the PDB data are maintained as a single archive and are kept freely and publicly available. The wwPDB members are fully committed to this principle. They also acknowledge the importance of global equality in the ability to deposit and access data and the need to have true international involvement and collaboration in maintaining the PDB. The Worldwide Protein Data Bank (wwPDB) was created to provide an organizational structure whose purpose is to uphold these principles. This document is revision of the 2003 wwPDB Charter Agreement. Implementation details regarding matters emanating from this charter are specified in the Appendix. The current members of wwPDB are the PDB managed by the Research Collaboratory for Structural Bioinformatics (RCSB) PDB, the Protein Data Bank in Europe (PDBe) at the European Bioinformatics Institute (EMBL-EBI), the Protein Data Bank Japan (PDBj) at the Institute for Protein Research in Osaka University, and the Biological Magnetic Resonance Bank (BMRB) at the University of Wisconsin-Madison. All four organizations serve as deposition, data-processing and distribution sites. Proposals for new members would be reviewed by the current wwPDB members. Questions about adherence to the guidelines set forth in section 4 will be discussed at the yearly meetings of the Heads of the wwPDB members as described in section 6.4. Serious violations by a member will be considered by wwPDB as the basis for revoking membership. Other data formats and delivery methods may be included in the PDB archive after full discussion and agreement among all wwPDB members. The term PDB archive is distinct from web sites, browsers, and database-query services that are independently developed at the wwPDB members’ own sites. The PDB exchange dictionary describes the semantics and naming conventions of PDB data that are processed, annotated and distributed by the wwPDB members. This dictionary resource is extended to represent new and evolving methods and technologies. wwPDB will use a common software framework for deposition, annotation, updating and distribution of the data. The wwPDB members agree to act as distribution sites of the PDB archive as defined in section 3.1 with identical mirror contents and subdirectory structure. The wwPDB members agree to use a single system for accession code assignment, deposition, annotation, updating and distribution of archive data. The wwPDB members agree to conduct updates to the PDB archive in a manner so as to ensure that a single version of the archive complying with uniform processing and format conventions is available at all member sites. One member of wwPDB will be chosen by the wwPDB members to be responsible for maintaining the master copy of the archive and to ensure that updates are delivered according to schedule. The wwPDB members agree that substantial changes in the content or organization of the PDB archive must be agreed upon by all the wwPDB members. Changes of this nature require at least 60 days notice to the user community. All changes or modifications of the PDB exchange dictionary will be agreed upon by the wwPDB members and will be reflected in the version number of the dictionary. wwPDB will keep all format documentation publicly available. 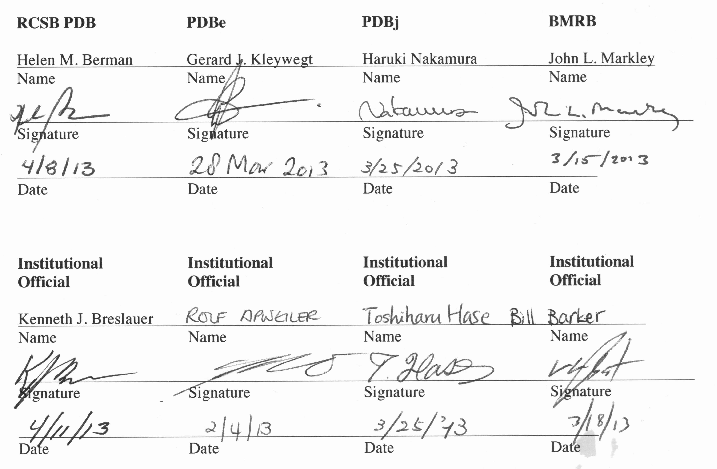 All members of wwPDB agree to the delivery of identical copies of data files contained in the PDB archive following the format and filename conventions adopted for the archive. Examples of reserved PDB records and current naming conventions used in the archive are included in the Appendix. If any wwPDB member becomes unable to fulfill its agreed role as described in this document, then a new agreement must be reached and finalized at the annual wwPDB meeting (section 6.4). If that member has particular responsibilities within the organization, one or more other members must agree to take on that responsibility. A website for wwPDB will be maintained. All members of wwPDB will agree upon the contents of this site. An Advisory Committee will be constituted whose role it is to review policy issues and adherence to the guidelines of wwPDB. It will also serve as a forum for dispute resolution. The Terms of Reference for the Advisory Committee will be agreed by the wwPDB members and detailed in a separate document. The wwPDB members may seek advice from their parent organization, their own oversight committees, advisory boards and funding agencies as to the best representation of their site. The costs of Advisory Committee meetings will be shared equitably among the members of wwPDB. Prior to each meeting, the members of wwPDB will agree upon the plans for sharing expenses and who will be invited as observers of the meeting, as well as on the agenda for the meeting. The wwPDB will have a yearly meeting at a site determined by the members. The meeting will be attended by the heads of the wwPDB member organizations and members of the Advisory Committee. The term of this charter will, assuming no review, be 10 years. After 5 years any wwPDB member may request review of the agreement and production of a “renewal agreement”. If unreviewed at 9 years, the agreement shall in any case be reviewed and a renewal agreement produced. A renewal agreement will come into force at the end of this agreement or one year after the finalization of its text - whichever is earlier. However, if all members agree, a renewal agreement may come into force earlier, at any point after its finalization. Each member organization agrees that this charter agreement will survive in its entirety notwithstanding cessation of operations of any member signatory for any reason.